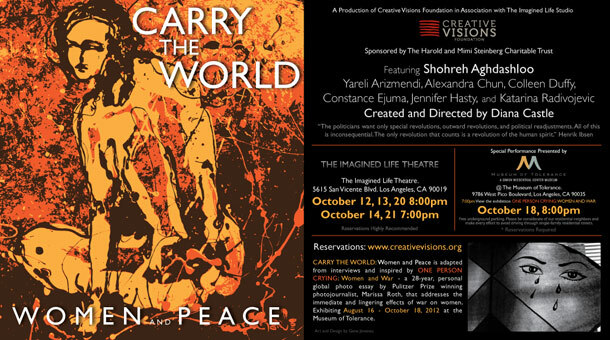 I am profoundly honored and am very pleased to announce that Diana Castle, an esteemed dramatist and writer has created a performance piece, “Carry the World: Women and Peace”, which was inspired by and adapted from interviews from my project, “One Person Crying: Women and War”. It will be performed at The Museum of Tolerance on October 18th, and at her theater, The Imagined Life, in four additional performances. Carry the World reservations are now OPEN at Creative Visions.